The current issue of the JuristenZeitung features two articles dealing with the effects of Brexit on private and economic law, including private international law. 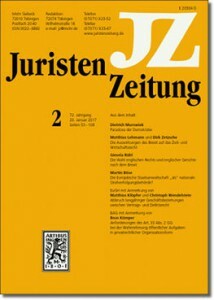 The first article, authored by Matthias Lehmann, University of Bonn, and Dirk Zetzsche, University of Liechtenstein, discusses the various options to bring about Brexit and analyses their consequences for the law of contractual and non-contractual obligations (including choice of law), corporate law, insolvency law and procedural law (Die Auswirkungen des Brexit auf das Zivil- und Wirtschaftsrecht, pp. 62-71). The second article, authored by myself, sheds light on the effects Brexit will have on London as a place for settling international legal disputes (Die Wahl englischen Rechts und englischer Gerichte nach dem Brexit. Zur Zukunft des Justizstandorts England, pp. 72-82). It shows that Brexit creates substantial uncertainty (1) as regards the enforcement of English choice of law and English choice of forum clauses and (2) as regards the recognition and enforcement of English judgments abroad. Unless the UK and the EU agree on the continued application of the Rome I Regulation, the Rome II Regulation and the (recast) Brussels I Regulation (or enter into a new treaty designed to enhance judicial cooperation in civil matters), Brexit will, therefore, make it less attractive to settle international disputes in London. Both articles can be downloaded here and here (behind pay wall, unfortunately). I am sorry to be a party-pooper, but Brexit, in whatever form it takes, will have no effect on “the enforcement of English choice of law” clauses. Post-Brexit, EU states will remain obliged to recognize and enforce these clauses in exactly the same way as they are pre-Brexit. Art. 2 of the Rome I Regulation (593/2008) makes it clear that “[a]ny law specified by this Regulation shall be applied whether or not it is the law of a Member State”, and Art. 3 provides that “[a] contract shall be governed by the law chosen by the parties”. One can safely assume (without the need for the Commission to incur the expense of a major academic risk assessment) that UK courts will continue to give effect to English choice of law clauses. The rest of the world will carry on as before. Equally, there is no requirement or necessity for the UK and the EU “to agree on the continued application of the Rome I Regulation, [and], the Rome II Regulation”. Neither instrument requires reciprocity . If it sees fit, the UK is free to incorporate the essential provisions of both instruments into domestic law, suitably modified to take account of the new realities, without the need to get the approval of any third party. It seems to me that the suggestion that without a specific UK-EU agreement on these applicable law instruments it “make[s] it less attractive to settle international disputes in London” is misplaced, and frankly is best put in that large box marked “wishful thinking”. It appears comprehensible to me that Brexit will have no major effect on the enforcement of choice of law clauses. However, I am not sure whether it is accurate to state that there will be no effect whatsoever in that regard. At least English courts will treat choice of law clauses post-brexit pursuant to domestic private international law which may at least a bit more restrictive than the Rome Regulations (e.g. as regards choice of law in relation to non-contractual obligations). It is from my point of view an entirely different matter however whether Brexit may render London less attractive as the place to settle international disputes. On the one hand, and in particular if the Brussels Convention 1968 will not (which is apparently controversial) provide a safety net, recognition and enforcement of English court judgments in EU member states may become considerably more time and money consuming. In addition, it would appear that an attempted derogation of the international jurisdiction of courts based in the EU by means of an exclusive jurisdiction clause in favour of English courts would not fall in the ambit of Art. 25 Brussels Ia Regulation. Hence, each EU member state may determine in accordance with its own domestic jurisdiction rules whether to accept the derogation of the international jurisdiction of its courts in favour of English courts.